This is a very long overdue update! Among other things, I have had a lot of trouble with my camera, but I did manage to get a few shots finally. 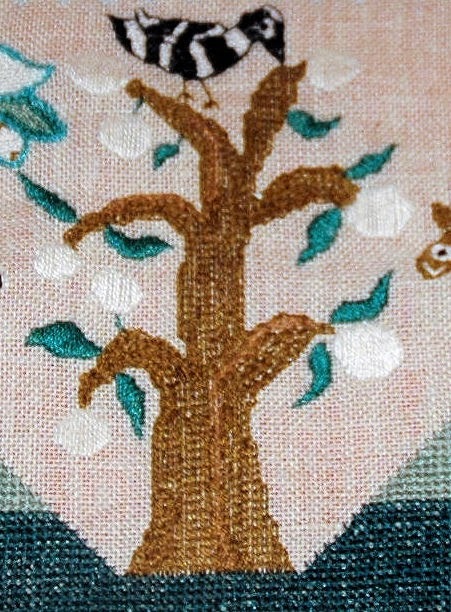 I worked on the tree which is stitched in a vertical stem stitch. The little bird at the top was a bit of a challenge! Next I continued working on the hills. Here is a close-up of the bull. He was a fun stitch! 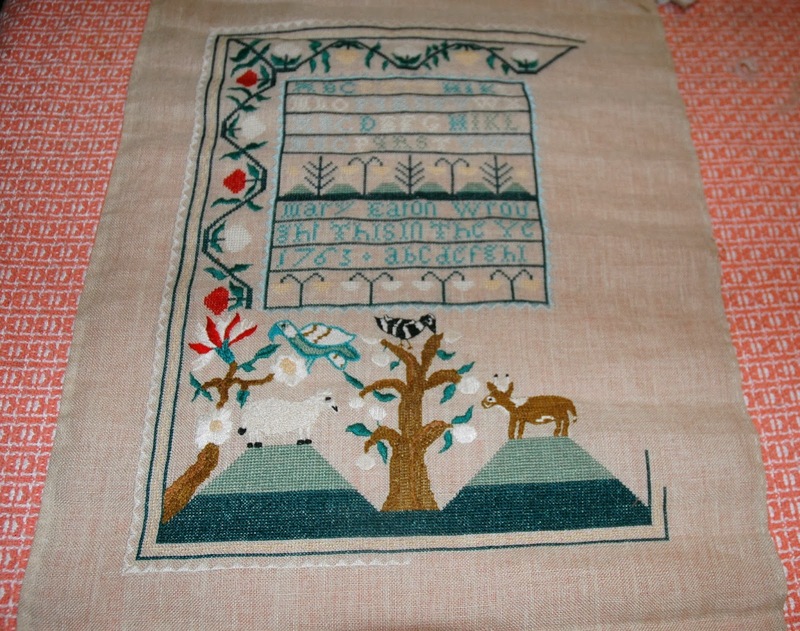 I continued to work on the sampler until I ran out of three colors. There definitely wasn't enough silk in the kit, as I was not even close to finishing. While I was waiting for the silk to arrive, I decided to work on a new project. This was a fun, quick stitch! I finished it in a couple of weeks. 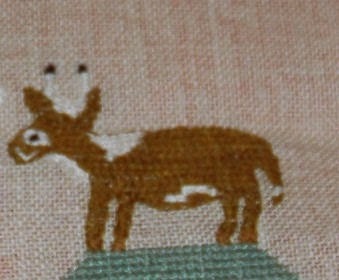 I stitched it on 32-count Sandcastle, and used the suggested Sampler Threads and DMC. I will have to find a nice little frame for it.
. . . Well, I have since received the silks in the mail, and I have already started stitching Mary again. I finished the tree on the right, and I am working on the second bird. I will post photos just as soon as I can. That is great progress on Mary Eaton - it looks like rather intricate stitching, and you're tackling it beautifully. And what a sweet Autumn finish, congrats. I love your progress on Mary! Wow! So beautiful! I'm glad you were able to get more silks from Marsha. That's a lot of silk you still needed! 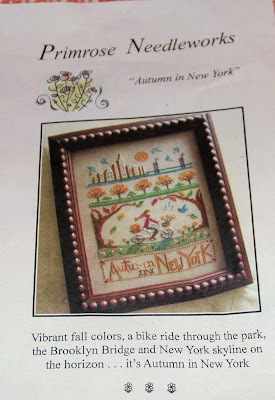 Love your Autumn finish too! 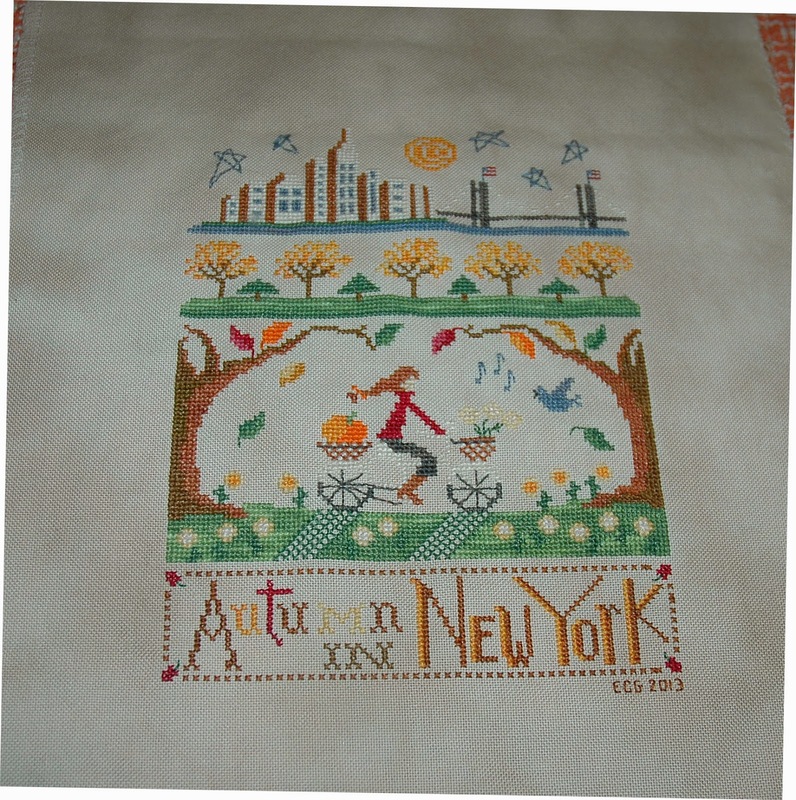 Wow I love it so much..beautiful stitching..
Lots of great stitching. The New York chart looks very cheerful to me. 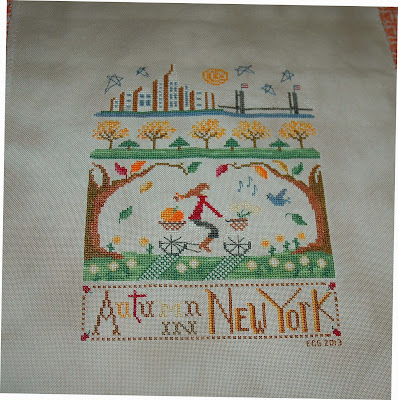 Mary looks really great, a beautiful sampler. Congrats on the Autumn in New York finish! Wow, that tree is incredible! And I love that little bird on top. The black and white are striking!